We often create new indexes to make content searchable in Plone. Many developers still do it wrong. Most new sites we create contain facetted search based on eea.facetednavigation. Thus we often create new indexes to make content searchable. One example is www.idea-frankfurt.eu where attributes and relations of projects are used to make them searchable in a useful way. But there was a known pitfall when registering indexes in catalog.xml that was only fixed in Plone 4.3.2. Even though Maurits van Rees warned about this in a blogpost which is also reference in the documentation I often see developers making that mistake. Unless working with Plone 4.3.2+, you should never register a index in catalog.xml because the index will be purged when reinstalling your package. Instead register new indexes in your setuphandlers.py. This was fixed in GenericSetup 1.7.4. I firmly believe that addons have to be reinstallable without ruining a site. """Method to add our wanted indexes to the portal_catalog. 'context' will be portal_setup and 'logger' will be None. # Called as upgrade step: define our own logger. By the way: Besides many other amazing features the package ftw.upgrade also has methods catalog_rebuild_index, catalog_add_index and catalog_remove_index you an use in your upgrade-steps. ... wield the awesome features of Plone for maximum effect. 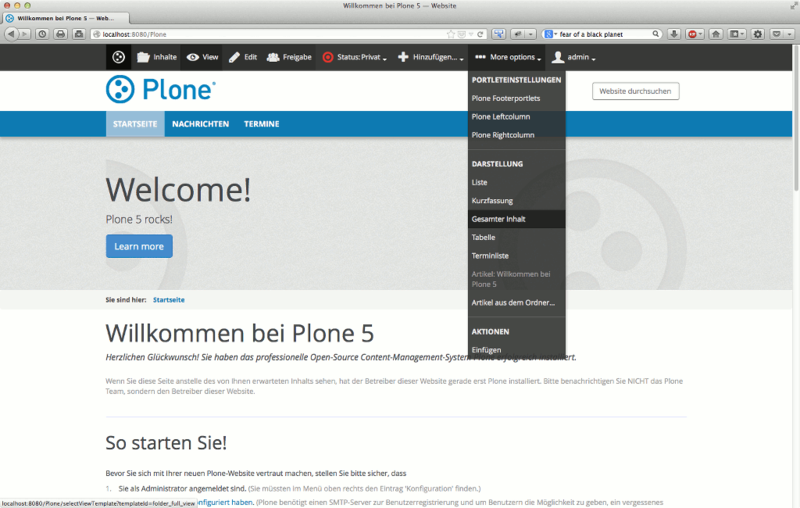 ... customize and extend Plone to make it do exactly what you want. ... use the current best-practices to become a Plone rockstar. In the first part we'll teach the fundamentals needed to setup and manage your own website using the many build-in features of Plone. The second part will focus on customizations that may be done through-the-web. The third and longest part will be devoted to Plone-development. Here we focus on current best-practices like Dexterity and Diazo that make developing with Plone fun and accessible. The training is for people who are new to Plone or used to work with older versions of Plone and want to learn the current best-practices. Basic Python and HTML/CSS skills are a requirement. As always, we give the training as a team of two Trainers. This way you'll receive a 1on1 training as soon as something works differently than expected. Something that is not possible with a single trainer and something that adds a lot of insight when something did not work as expected. Due to illnesses we currently have three open slots for the training. Talk to us if you are interested. When we prepare a training, we always create more material than what we can walk through in the short amount of time we have available. We decided that we want to offer you more by extending the training period to 5 days. In 5 days we can cover the material deeper have more exercises and additional topics. More information is available on our dedicated training page. Update: By popular demand we moved this training from november 2014 to 2. - 6. March 2015. We will inform everyone who contacted us about the training about the new date. The drive towards Plone 5 is gaining momentum as the goal seems to be in a reachable distance. For the first time there actually is a state of Plone 5 that is can be shown to people who are interested in the future of Plone. The essential building-blocks of Plone 5 are starting to look presentable: The new barceloneta-theme is really nice and comes with the new toolbar and the new widgets. Don't get me wrong, there is still quite some work to be done before a final release but the first alpha-release is in the making and the current state can actually be shown. These screenshots are from a fresh build of the coredev.buildout. To reach Plone 5 the Plone-community is organizing a staggering number of sprints. My sprint-plan for 2014 looks like this: Cologne, Munich, Munich (again), Sorrento, Berlin, Bristol. I recently attended the cathedral-sprint in Cologne, organized by the tireless Timo Stollenwerk and generously sponsored by GFU Cyrus AG. Timo, whose sole purpose in life sometimes seems to be to keep Jenkins happy, organized another impressive display of the spirit of the Plone-community as 30 people from around the world gathered there to work in groups on pushing Plone 5 towards readiness. It is great to see so many originally separate efforts coming together smoothly and making a whole new thing that will be at the core of Plone 5. Collections are now a behavior that can be enabled on any content-type. The collection-type is basically a folder with that behavior. The shiny new event-type now uses the behaviors provided by plone.app.event including support for recurring events and timezones. Richtext-fields are now a behavior shared by most types. We now have migrations from 14 different content types to the new types including migrations for four (!) iterations of the event-type. I have been using plone.app.contenttypes since before the project officially existed and I think every plone-developer should give it a try and report any issues especially regarding migrations to make it safe to ship with Plone 5. It was a real pleasure being reunited with old friends and making new ones. It is especially encouraging that even at sprints there are always new people showing up and contributing to Plone. The next big sprint on my agenda is the Wine-and-Beer-Sprint in Munich. For the second time we are organizing this sprint together with our friends from Syslab.com and again it is a double-sprint with a leg in Munich and one in Capetown. 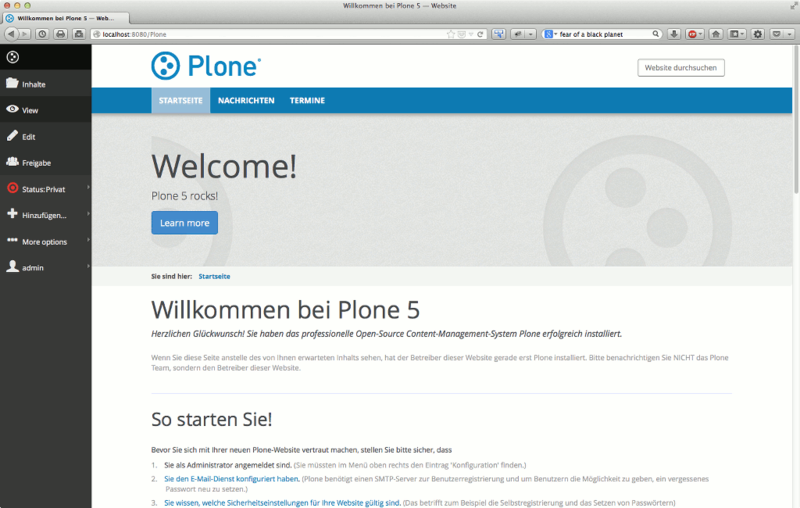 We will continue working towards Plone 5. 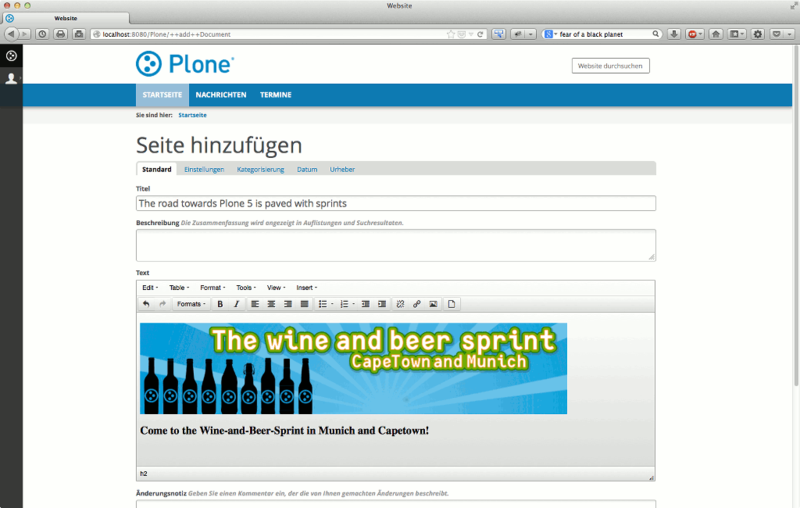 The necessary tasks to get Plone 5 out of the door are summarized in this ticket: https://github.com/plone/Products.CMFPlone/issues/184. Register now since we only have a limited amount of places! If you really need additional incentive to attend, here they come: A fine selection of Single Malt Whiskeys, a great sprint-location that is accessible 24h, Sichuan Hot Pot and white sausages (not to be mixed). The Wine and Beer-sprint is is preceded by the DocSprint (also in Munich) that focuses on consolidating, improving and versioning(!) the documentation for Plone. See you in Munich and elsewhere!